A Game of Discovery, Geography, and History in the land of Poets and Thinkers. Explore and settle the storied land of Germany using the elegant, award-winning game design from The Settlers of CatanÂ®. Here, you will find great social interaction, simple rules, beautiful German geography, rich history and lore, and 12 wonderfully-sculpted landmarks. 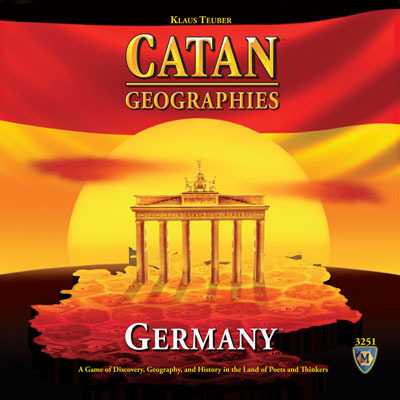 â€œCatan Geographies: Germanyâ€� is a game about trade, building, and settlement. Start with town halls in 3 cities. Then build roads to neighboring cities, where you can purchase landmarks and new town halls. Town halls create resource production, while the unique landmarks generate special awards. Both yield victory pointsâ€” as do the Longest Road, Largest Army, and the historically-based victory point cards. So, have fun with friends or family while casually discovering the novel geography and history of Germany. An amazing, color map board depicting 28 different city scenes and 12 historic landmarks. 120 cards (including 90 resource cards, 26 development cards, and 4 building cost cards). 141 game pieces (including 12 landmarks, 80 roads, 48 town halls, and 1 â€œGÃ¶tz von Berlichingenâ€�).